For the Inaugural Dublin Biennial 2012 the 55 International Artists exhibiting represented 20 countries, Austria, Armenia, Brazil, Croatia, China, Denmark, Finland, France, Holland, Iran, Ireland, Italy, Korea, Malaysia, Norway, Poland, Russia, Spain, Sweden, and the USA. The Dublin Biennial 2012 was housed at the Point Village, in a 10,000 sq. foot space. In addition to the Gallery space, the Biennial presented Film Screenings at The Odeon Cinema Point Village along with daily performances and discussion groups in the 'POP-UP' performance space in the Gallery. The Dublin Biennial Pop-Up 2012 was funded by the participating artists and all work to date and so-forth has been carried out on a volunteer basis. Among the International artists participating were Yoko Ono (USA) and Brazilian Artist Christina Oiticica. 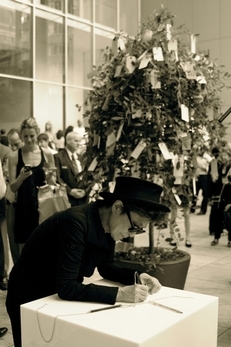 For the Inaugural Biennial, Yoko Ono presented her "Wish Tree For Ireland" installation along with a video. 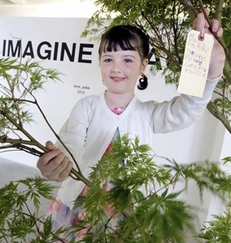 The "Wish Tree For Ireland" was an invitation to all, to place personal wishes on her tree during the exhibition. The wishes were then transferred to The IMAGINE PEACE TOWER in Iceland, and became part of her 1,000,000 wishes project. Yoko Ono is an artist whose thought provoking works have challenged peoples' understanding of art and the world around them for many decades. From the beginning of her career she was a Conceptualist whose work encompassed performance, instructions, film, music and writing. Brazilian Artist Christina Oiticica - is known for her 'non-concretist' Land-Eco art technique of combining paintings with the earth and the elements. Using the earth as foundation matter, Oiticica 'buries' her work in the earth for up to a year - the paintings, when unearthed, reveal the indelible marks contributed by nature to her works. She has buried her canvases in the Amazon rain forest of Brazil, the Sacred Valley of Ganespurs in India and along the route to Santiago de Compostela. Ms. Oiticica had installed "Heart of the Earth", a site specific piece for The Dublin Biennial 2012.
that have No food some food"